Research in the natural and social sciences has shown this conception to be too narrow. Intelligence is a property of collectives. For the purposes of this paper, one takes a collective to be some entity distinguished as being non-atomic. Ant colonies, swarms, flocks or herds are examples among the non-human animals. Collectives of people may exhibit superior problem-solving capabilities than any of their most intelligent members. Even individual intelligence may be conceived as the intelligence of the collective of neurons that constitute one person’s brain. Creativity is the primary asset in this framework. collaboration. Taken together, these elements cultivate a competitive innovative culture. The community generates collective intelligence to solve the social, economic, and environmental challenges of the world. Creativity. — is leveraged with critical thinking skills and an ability to ask questions. 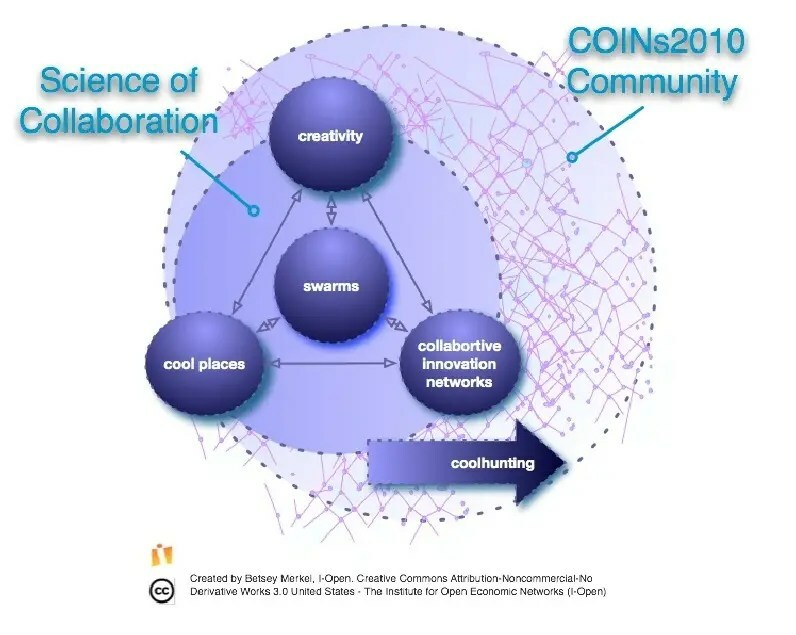 COINs — collaborative innovation networks. act as information infrastructure to transport creative ideas to accelerate business development in towns and cities. Cool places. — attract the conversations of entrepreneurs focused on health care, energy and, food, and water. Swarms. — are created from numbers of people attracted to the next big idea that has surfaced from the crowd. Swarms build capacity. Coolhunting. — is the practice of seeking the most creative ideas and people; cool farming is the practice of collaborating to help them succeed. Strategic branding are the stories we share. This year we are asking what is relevant with regard to the innovative powers of creative swarms, what are the observable qualities of virtual collaboration, and how does the quest for global cooperation affect local networks?